How do I set a limit for the maximum number of tickets that can be sold for an event? /Creating, Editing and Managing Events /How do I set a limit for the maximum number of tickets that can be sold for an event? 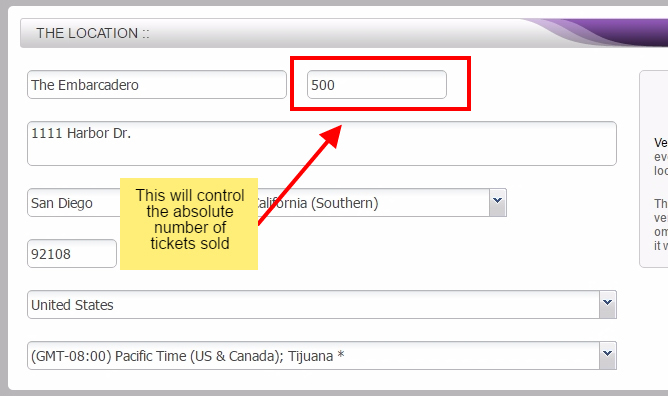 To limit the absolute total amount of tickets to be sold at an event you must set the Venue Capacity while editing your event under the section “The Location”. By setting this, it will not allow your event to oversell. You will be able to set all your ticket types to any maximum number to be sold and if the Venue Capacity for the venue is reached, all sales will be halted and notify the customer that the event is sold out.